But Melinda definitely needs her coffee in the morning despite not really drinking the stuff much until I came along. So it fell upon me to run out for some emergency coffee orders. The plan was a quick drive to the Starbucks that sits a few intersections down from our neighborhood on Windy Hill Road. Since they have a drive-thru window, I wouldn’t even have to get dressed! Thus, garbed in a bathrobe and a simple coat, I set off on my short trip – it turned out to be shorter than either of us thought it would be. As I came to a stop at the entrance to my subdivision, I recognized one of my neighbors Lisa standing out in the grassy median on Windy Hill. She owns a golden retriever mix named Lacy who is often at odds with Doobie when they encounter each other on walks through the neighborhood. Lisa appeared to have Lacy sitting beside her. For a confused second, I thought that it was a rather cold morning to be taking a walk and that doing so in the middle of Windy Hill wasn’t the best idea. I then realized that Lisa wasn’t holding a leash and that the dog was definitely not Lacy – in fact, it appeared to be a mostly white female pit bull. I was instantly reminded of the awful night on October 10, 2007 when Bodie had escaped and been killed by a car on Windy Hill. I knew that I had to make sure that the same thing didn’t happen to this scared dog that my neighbor was trying to help. Nerves mounting, I stepped out of the car into the cold morning air in my bathrobe and inadequate coat. I must have looked rather amusing in retrospect. Lisa had a small dog-treat and was trying to calmly lure the pit bull to within collar-grasping reach. The dog wasn’t buying it though as she was obviously scared, sitting in the median just out of reach and howling in fear. I spoke with Lisa and she informed me that she had been coming home on Windy Hill and seen the dog out there. Knowing that it would likely get hit out there, she had come back to the road with a treat and her dog Lacy’s leash in hopes of catching the dog before it could get hurt. At about that time, another neighbor in his car pulled up behind my car and got out to help me. I noticed that some cars were coming and the dog was looking a little jumpy. She started to walk out into the road, and I felt a rush of panic. I stepped out into the road to try to stop traffic and thankfully my neighbor joined me. Together, we stood in each of the lanes on our side of the road and directed cars safely around the scared dog as Lisa calmly lured her back to the safety of the median with the treat. By now, a few other neighbors had come out of their houses to see what was the commotion was. Lisa asked one of them to call Animal Control, but I urged against this idea. During my experiences in helping Ramses the pit bull reunite with his owner, I had learned that our country has a policy of euthanizing pit bulls that are handed over to Animal Control after the legal five days period during which an owner can attempt to reclaim. The reason is that because of the breed’s (unjust) bad reputation, they are not considered adoptable and so they are killed to make room for other animals. As I was sharing this information with my neighbors, I was pleased to see a Smyrna policer officer arrive on the scene. My neighbors and I had been doing a fair job at directing the limited traffic up until then, but it’s definitely more reassuring that people will stop when there’s a police car and an officer in uniform standing there. Shortly after the officer arrived, one of my neighbors managed to distract the pit long enough for Lisa to grab its collar and hook her up to the Lacy’s leash. The dog tried to bolt in fear, but we had her now and led her into the safety of our neighborhood. The officer said that he was going to call Animal Control, but I made a quick decision and explained to him that it wasn’t necessary because if no one else could do it, my wife and I could take the dog back to our yard and try to find its rightful owners. I told him why I didn’t wish to see the dog go to Animal Control and he acknowledged that I was correct. He said that he was an animal lover as well and that if I was prepared to take the dog back to my house that he was fine with that. So I drove back home to give Melinda the unpleasant news while Lisa graciously followed on foot with the dog. When I stepped back inside the house with a grim look on my face, I told Melinda: “I’m back without the coffee… And you’re not going to be happy.” I then told her what had happened at which point you could see the mild panic in Melinda’s eyes as she reiterated like a protective ritual chant the fact that “We are a one dog family!” I tried to reassure her that I did not intend for this dog to become dog number two, but that I could not let it be put to death for the crime of being a stray pit bull. After a few moments of discussion, we decided that I would get to work on doing all the various things that are necessary when one finds a stray while Melinda who still very much needed her coffee (especially with the new developments) would take a shower and head out to get some coffee. I went outside to meet Lisa and the pit bull who were both now in my back yard where mercifully the gates were fully repaired and working and no sections were missing from any late night car accidents from the nearby apartment complex. Lisa said that we could borrow the leash and that she would come by later with some treats and extra food. She then left to get home to her husband who was sitting with their baby and probably wondering what had happened to his wife. Lisa had let the pit bull off the leash to try to calm her down in the back yard and so now it fell to me to try to establish a rapport with the beast. I got an almost full can of Pupperoni Snacks from the kitchen and then sat down on my back porch to patiently try to earn the dog’s trust. She remained very scared, but slowly approached me to gently accept the treats that I offered. Any attempt to pet her though resulted in her fleeing out of reach. It was going to be a long morning, and it didn’t help that it was freezing outside and my dry hands were painfully exposed to it. After awhile it became clear that I wouldn’t be able to stand sitting outside with her for too long, and yet I have never fully trusted my fence since the first time Bodie escape from it with the assistance of strong gust of wind and so I didn’t want to simply leave her out there. I went inside and erected our old dog gate that we had used when we first got Bodie to keep him confined to the kitchen during the day before we trusted that he would have no accidents in the house. This would serve to confine her to the kitchen and to keep her away from our dog Doobie. We knew from his recent contact with our friends’ two dogs and his trips to the dog park that he could be okay around dogs when properly introduced, but this pit bull was an unknown factor. While pit bulls are very people friendly, they sometimes do exhibit dog aggression as they were bred for fighting dogs and baiting bears. They are also one of the canine world’s premier athletes as was quite obvious by this dog’s toned and muscular frame. I couldn’t risk the two dogs getting into a fight so the gate was a necessity. I then spent an hour trying to lure the dog into the kitchen. She would always readily come inside and gently accept treats, but only when I was sitting down on the floor. By the time, I could get to my feet and close the kitchen door, she would have beaten me to it and dashed to the safety of the yard. I eventually accomplished my goal by throwing treats to the far side of the kitchen and then dashing to the door while she was out of the way. That first day was a small piece of hell. My face and hands were dried out. My hands were still aching from the cold. My dog Doobie was confined upstairs where he whined without ceasing – which is his speciality. It was a Sunday so all the vets, animal rescue organizations, and the humane society were unavailable for contact. Still, I was able to put together a plan of action for the next day and the dog was very sweet and easy to manage inside the kitchen while I tried to get some stuff accomplished on my MacBook. Melinda returned and put together a DOG FOUND flier in Power Point and then she stayed with the dogs while I traveled around for two hours posting the fliers at every logical intersection in my extended neighborhood. This tactic had worked for Ramses and I was really hoping that it would work for this dog as well. My second hope lay in the fact that the next day I could get her scanned for chips that could identify her owner. That afternoon, we decided to try a bold experiment as the separation created by the gate was really annoying and not something that we desired to experience for possibly several days. We took Doobie and Dog Two (as Melinda started to call her) outside for a game of frisbee in the yard. At first things looked promising. Doobie excitedly fetched his frisbee while Dog Two seemed interested and followed while hanging back a bit. 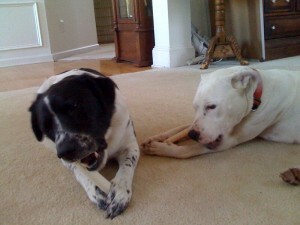 Then, after a few tosses like this, Dog Two started getting up in Doobie’s face and began to try to mount him. At that point, we immediately separated the two before anything bad could start. Thankfully, Dog Two wasn’t too difficult when it came time to go to sleep at the end of that exhausting day. Melinda and Doobie went upstairs and I stayed in the kitchen until Dog Two seemed to drift off. I then slipped over the breakfast bar of our kitchen and slinked quietly upstairs. The next day was disappointing as we found that Dog Two did not have any chips. Also, the vet suspected that she may have been abused as she seemed very nervous about letting people touch her neck behind her head. We found out that our vet could board the dog if we got her vaccinated and so that remained an option for us we couldn’t locate the owners before our planned post-Christmas plans of driving to Florida to visit my mom. It was an option I didn’t wish to exercise though as already the very sweet Dog Two was winning her way into my heart and the thought of her in cage like that for days on end seemed awful and also counterproductive should we have to move from the locating her owners phase into the finding her a home phase. Unfortunately, thanks again to the inaccurate bad reputation of pit bulls, most rescues will not take them because it’s not an efficient usage of the resources that they have seeing as it will be much harder to adopt out a pit bull than most other breeds. There are only two rescues in Georgia that I know to help out pit bulls: Pit Prints Rescue and the Georgia Society for the Prevention of Cruelty to Animals. Naturally, when I contacted them their fostering resources were already filled to capacity. Pit Prints however offered a ray of hope in that should it become necessary we could pay to board Dog Two with them rather than board with our vet. This was a blessing because boarding at Pit Prints would mean home boarding with lots of human interaction and chances to nurture adoptable qualities. It was a crazy and exhausting week, and Melinda and I both savored our time spent away from the situation while we were visiting her mom and her stepfather for Christmas Eve and Christmas Day. Because of our reluctance to board the dog and because she was showing signs of learning to behave around our dog through brief controlled encounters in the kitchen, we decided to cancel the planned to trip to visit my mother in Florida. Fortunately, she was understanding about why we couldn’t make it. It turned out to have been a good turn of luck actually because after Christmas, Melinda and I both caught a nasty cold that has been hanging around us for the rest of the vacation. I’m glad we didn’t have to suffer through a long car trip while sneezing and coughing and feeling miserable. On the day before Christmas, we had spent two hours posting up some improved FOUND DOG fliers. It was kind of depressing that evening when the weather forecast proved wrong and rain poured down on Smyrna trashing most but not all of our hard work. When we returned to our house at night after spending all of Christmas Day with Melinda’s mom and her stepfather, we received a wonderful Christmas gift: I let Dog Two and Doobie outside into the backyard and they proceeded to have a grand time playing with another. Dog Two had been very sweet through all of this and really the only thing standing between us housing her for long term was her interaction with Doobie. We decided that given this new turn of events and seeing that fostering her would involve housing her for several months that rather than take another pit bull’s chance for adoption, it would just be better to adopt her ourselves should the original owners not come forward. Despite this decision, we still continued doing all that we could to locate her original owners as returning her to them would be best. I reposted fliers where the rain had flushed them away and made sure to leave fliers with all local vets. I also posted ads with the local newspapers and with craigslist. I finally managed to get in touch with a person at the humane society and they took our information, but no one had contacted them all month looking for a dog matching her description. With that bit of information and given that our fliers have been up for most days since we found her, I’m guessing her owners aren’t looking for her and so she will wind up being our pet. We named her Peppermint because we found her over the Christmas holidays, she is sweet, she keeps it cool, and she kind of reminds us of peppermint with her pretty white coat and her nice off-red collar that we purchased for her. She’s a very sweet and docile dog who loves people instantly, warming up to new ones now that she’s no longer cautious about us. My day of patiently dosing her with treats to lure her inside the kitchen and to win her trust have paid off by creating a strong attachment to me already. Peppermint is still pretty young. I’d say she’s full grown, but still has her puppy energy about her. She and Doobie play together pretty well, but frequently she gets a little too feisty for him and you can see he finds her a bit of a nuisance at these times. Still, with a little training she should be able to pass her Canine Good Citizen Test and be a model citizen. She is very intelligent and picks up on things quickly. Sometimes a little too quickly. For instance, we had been keeping her in the kitchen behind the gate at night, but after a few nights like this, she figured out she could hop over the breakfast bar just like we were doing. That led to us allowing her to sleep in the bedroom with us which seems to be working out alright for now. We don’t want to allow her to roam the house free until we can be fully certain that she won’t have any accidents or chew on anything that she shouldn’t be chewing. It wasn’t what we planned, but I think Peppermint will fit into our family nicely and she will ultimately benefit Doobie by giving him more exercise than we give him alone which will help him take off some of the extra pounds he is carrying around. I just realized that my infrequent posts to this site these days have left this story incomplete. Alas, Peppermint didn’t fit so nicely into our family as I had hoped. She eventually grew more relaxed in our house and became far too energetic for our house and far too vigorous in her play for Doobie. As it became clear that we needed assistance, we began working with a wonderful local Pit bull rescue (Pit Prints Rescue) to see about us fostering Peppermint until a more suitable home could be found. We worked with Pit Prints for eight months, during which time I became more and more attached to Peppermint while Melinda found herself disliking her more and more as her high energy levels racked up more and more casualties in our home (curtains, bed, etc.). We boarded Peppermint with Pit Prints Rescue during the last month of August 2009 while we were on vacation. When we returned, we were blessed to find that another family working with Pit Prints had taken over fostering Peppermint for us while we continued to support her financially. This new foster family already fostered three other Pit Bulls and seemed much better at providing for her needs. As we were already paying for her food, toys, and vet bills, it was no problem to continue to do so as this family took her into their care. It has been a bad year for pets in need of rescue and adoption this year with the economy taking such a hit. 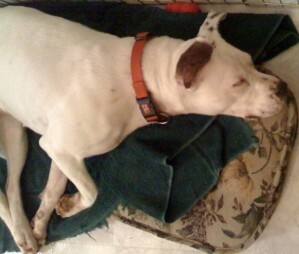 It has been especially bad for breeds like the Pit Bull that have a bad image in the media. Peppermint is still being fostered with Pit Prints Rescue and is in need of finding a family that can adopt her and provide her with a home where an intelligent and energetic dog can get all the attention and exercise that she needs. You can read more about her here. I can imagine your mom, as another dog lover, being understanding. Reading this post (over coffee :)) put a smile on my face, as I also remembered your character and thought how clearly this act of compassion fits it. Glad I could make you smile. :) Just to clarify this post is exactly 1 year old today. :) I should probably update it so people don’t think we still have Peppermint.